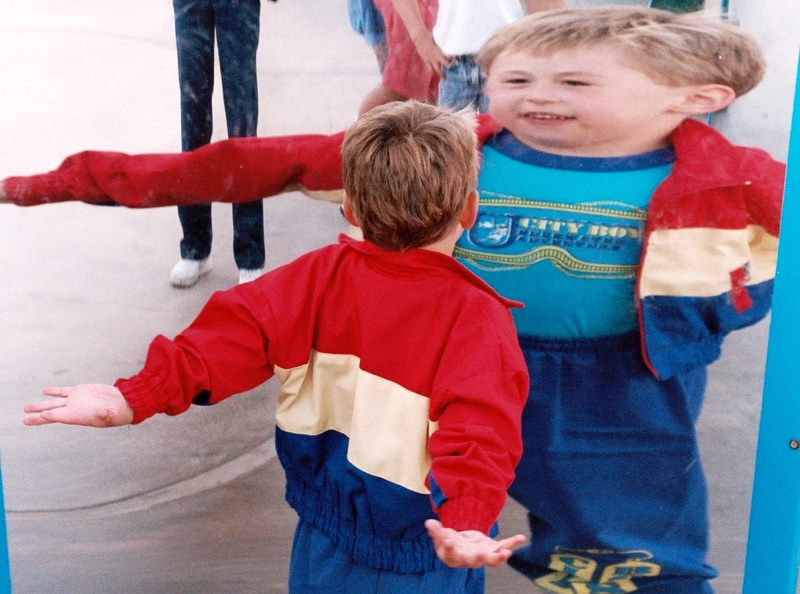 Matt see himself (sort of) in a funhouse mirror in San Diego, California, Spring 1992. WOW, I love this poem! What do you see when you look in a mirror? How does it differ from what others see when they look at you? Bob, to quote an old saying loved by many women, “It takes a mighty good [spouse] to be better than none.” At least you didn’t say “someone I HOPE is destined to spend the rest of his life alone” 🙂 as some men might. Your photos go out into the world as your own “cyber hug” to humanity, and you get many in return. Merry, you are looking in MY mirror, that’s ME you are seeing (minus about 15 years). About the only reason I wish I could be queen is to have a personal hair dresser…but the job would drive anyone crazy! Oh, if only bread could be magically transformed into the miracle food that holds all the nutrients we need to live! Your “three basic food groups” listed there are near the top of my list, too. llet reven ll’I! Believe it or not, I almost looked your comment up on Google translate. gninrom siht thgirb oot ton m’I. I can, however, see your smile in my imagination, bright as always. My beautiful grandmother used to tell her granddaughters to “be pretty,” and from her I learned that “pretty is as pretty does.” Of all the words from her that I cherish, none is more dear to me than those. Thank you, Granny — and Sheila! Oh, Sheila, thanks for saying that – my great-grandmother had said “fitty is as fitty does” (not sure why, but she was from Cornwall, so the saying may have been a little different there). A very good reminder! And it goes well with today’s UR message about not judging. I see me, an outer image that has changed with the years, and all that is encompassed in them. I also see the more important, I, that has a few dings, yet is still easily recognized, whether in youth or aged. Thank you, Alan! I feel much the same. I’ve learned to be fond of the “dings” that come with age. Survival is something to cherish, and I do not long to go back to my younger years. I’m glad you see the things that do not change! I never like what I see in the mirror at first glance Julia. This aging face is not how I feel inside. But when I look longer and remember to turn off the ‘appearance’ criticism – I quite like who I see. 🙂 Thank you Julia, you have just added more happiness to my day! Hmmmmm. It depends on the day. I’m working on seeing the positives alone. Everything else is wasted energy, isn’t it? Alys, yes, and with my frequent energy crises, I can’t afford to waste any! My mirror too has the oddest habit of showing me looking tremendously different at different times, but until it learns to be consistent, I shall have to furnish the consistency from within my own mind. So yes, positives alone!